We have more than just the right parts and tools; we have the right answers. We understand that time is money to every customer, and when your equipment is down, you need the right parts to get a machine up and running as quickly as possible. From replacement parts to routine maintenance to unexpected rush repairs, your local Five Star Equipment branch has the experienced product support professionals to get you back to work quickly. 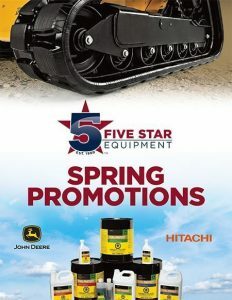 Get back on track with Spring Promotions! Spring is here! Make sure your compact machine components – rollers, idlers and sprockets – are ready for the season!